Pies, lots of pies, vie for recognition in the apple pie bake-off. Apples await tasting at the UC Santa Cruz Farm & Garden Fall Havest Festival. Fresh produce, music, farm tours, cooking demonstrations, and much more await visitors at the 2016 UC Santa Cruz Farm & Garden Fall Harvest Festival, Sunday, Sept. 25, from 11 a.m. to 5 p.m. at UC Santa Cruz’s 30-acre organic farm. The festival features live music, including performances by Singing Scientist Peter Weiss and the Earth Rangers, Glad to Be Here, and Ancestree Reggae. Also on tap: hay rides, kids’ crafts, workshops, organic pumpkin, produce, and plant sales, and campus and community group information tables. Visitors of all ages are invited to sample apples, enter the pie baking contest, try their hand at pressing cider, scale the climbing wall, and enjoy locally sourced, tasty treats. The festival will also feature a produce sale with organically raised pumpkins, fresh vegetables, flower bouquets, and a selection of perennials for your fall landscaping needs. Workshops on making agua fresca, growing and making cut flower bouquets, and saving seeds are also on the schedule, along with tours of the farm and an herb talk and walk through the garden. Want so see how your favorite apple pie recipe measures up? Be sure to enter the Apple Pie Contest by 12:30 pm (see rules, below). Admission is free for UCSC students, kids 12 and under, and members of the Friends of the UCSC Farm & Garden; general admission is $5. The Harvest Festival is cosponsored by the UCSC Center for Agroecology and Sustainable Food Systems (CASFS), UCSC’s Measure 43, and the Friends of the UCSC Farm & Garden. The UCSC’s OPERS program and College 8 are also supporting this year’s event. For schedule details and directions to the UCSC Farm, visit the CASFS web site at http://casfs.ucsc.edu. Free parking will be available at the Campus Facilities and Barn Theater parking lots, and a free shuttle and bike valet will be available. For more information call (831) 459-3240 or email casfs@ucsc.edu. FSWG Food & Farm Songs & More! 11:15 a.m. – 12:30 p.m.
Singing Scientist Peter Weiss & the Earth Rangers 12:45 – 2 p.m.
Glad to Be Here 2:15 – 3:30 p.m.
Ancestree Reggae 3:45- 5 p.m.
Herb Talk & Walk through the Garden – Darren Huckle, Western/Chinese herbalist & licensed acupuncturist Noon-1 p.m.
Agua Fresca: Fresh Fruits & Cool Fun–Food Systems Working Group 1:15–2:15 p.m.
Tours of the UCSC Farm – Farm & Garden docents 1:30 p.m. and 4:30 p.m. Winners will be announced between 2 and 3 p.m. 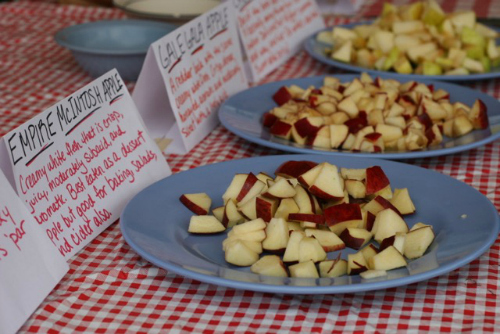 The Friends of Farm and Garden Apple Pie Bake-Off is a nonprofessional baking competition open to Harvest Festival attendees. (Entry to the Harvest Festival is $5; free admission for UCSC students, Friends of the Farm & Garden members and for children 12 and under). Contestants are responsible for supplying all ingredients and baking the pie prior to bringing it to the contest. Contestants' entries are judged on taste, presentation, and creativity. The decision of the judges shall be final. Pie not consumed during judging will be returned to the contestant. 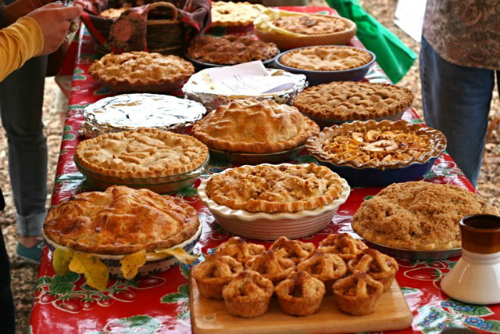 All pies must be entered by 12:30 p.m. Sunday, Sept. 25, at the Fall Harvest Festival, UCSC Farm. For questions or additional copies of the rules, call (831) 459-3240 or e-mail casfs@ucsc.edu.